Venus Transit: Unlike the May 30, 2003 Annular Eclipse which I had to go to Iceland to view, I was able to see at least a part of the transit of Venus across the face of the Sun from my back yard. There were some clouds when I got up, but by the time my equipment was in place at 6:10 a.m. it was clear enough to see the black dot of Venus crawling across the face of the sun. In Europe they were able to see the full event, but from my location on the East Coast I saw about the last hour of it. Photos of the full sun were taken with a Canon 1D, 300mm f4 lens, stacked 1.4x and 2x teleconverters, ISO 200, exposure between 1/80 @ f11 and 1/100 @f16. There must have been a slight haze in the air because this was slower shutter speed than my tests the previous weekend. The closeup was taken with a digiscope consisting of a Meade ETX 125 telescope, a 20mm eyepiece, and a Canon S330 2-megapixel camera. I'm not sure of my calculations, but I think the view below is 135x. Click on any image to load wallpaper-sized image. No mistaking where to look. I didn't quite get the so-called teardrop effect, but this is near the end of the transit. I'll try again in 2012. At this magnification the rotation of the earth quickly carried the planet and sun out of the telescopes's field of view. That's why the image is slightly motion-blurred. Next time maybe I'll have a telescope with a tracking motor. 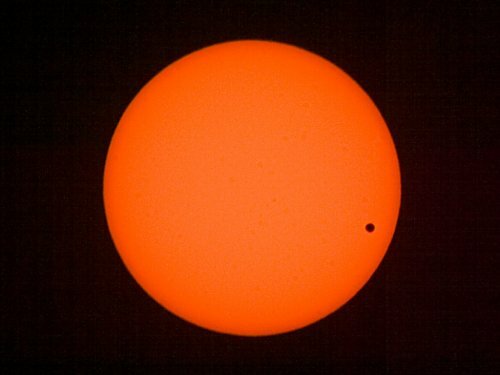 Only three large bodies come between the Sun and the Earth: Venus, the Moon (as seen from Iceland last year) and Mercury. 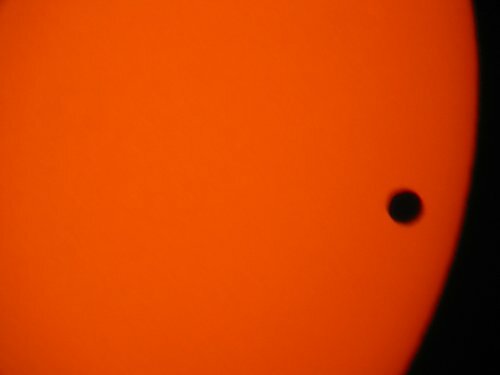 The next Mercury transit is in 2006. It will be a much smaller dot than either Venus or (certainly) the Moon.